BETHLEHEM (Ma‘an) 11 Sept — A six-year-old Palestinian girl was run over and killed by an Israeli settler Saturday evening in the village of al-Khader south of Bethlehem, on the road to the illegal Israeli settlement of Efrat in the southern occupied West Bank. Initial reports from local sources said the girl was hit by accident. However locals told Ma‘an the girl was standing on the sidewalk in front of her house when a fast-moving vehicle approached and hit her. The impact reportedly broke her neck. An Israeli police spokesperson told Ma‘an the girl had been killed in a “road accident,” but said she had been walking across the street alone when she was hit. He also confirmed that the driver turned himself in and that police were investigating the incident. He said the girl was believed to be between four and five years old. She was identified as Lama Marwan Mousa by the director of the ambulance and emergency department of the Palestinian Red Crescent in Bethlehem Muhammad Awad. According to Awad, Palestinian Red Crescent crews attempted to reach the scene after receiving a call about the accident, however ambulances from Israel’s emergency services Magen David Adom arrived first, attempted to revive her, and evacuated Lama to an unknown destination and declared her dead shortly after. The Palestinian Red Crescent then arranged to transfer Lama’s body to the Beit Jala Governmental Hospital. Lama’s house is in the area of Umm Rukba in al-Khader located in Area C, the more than 60 percent of occupied West Bank under full Israeli control. Her family’s home is located near a road commonly used by Israeli settlers residing in the illegal settlement of Efrat. Al Jazeera 11 Sept by Imran Khan — Tragic death of a six-year-old girl a reminder for some of the tension and double standards that persist in these hills — The cooler evenings of September in the hills of the Occupied Palestinian Territories are a perfect time to sit out on the balcony and chat with family and friends over coffee and grapes. On Saturday evening around 8pm, the Da‘adoun family were doing just that in the town of Al Khadir, south of Bethlehem. Yousef Da‘adoun was smiling and laughing with family when his children and their friend Lama decided to go play outside. “Be careful I said to the girls.” Still grieving he continues his tale. “We sat on the balcony when I heard a big boom and cars screech to a halt. There was screaming from below. I ran out onto the street.” What he saw will stay with him. His friend’s daughter, Lama, aged 6 was lying on the road. A Palestinian driver, Ali Mousa, witnessed the accident. “The Israeli settler got out of the car, and started shouting ‘what did I do! What did I do! '” Ali isn’t sure whether the driver or another Israeli settler called the ambulance. Paramedics who arrived on the scene could do nothing. Lama was killed almost immediately … Both Israeli and Palestinian authorities say the incident was an accident. Still, nothing is ever simple in these hills. On Sunday I visit the family. A short distance away Israeli soldiers stand guard in full combat gear and with tear gas canister guns already loaded. After noon prayers young Palestinian guys mill around the family’s house. Lama’s family indicate it was an accident but they fear the settler will not be brought to justice and will not face prosecution. Israeli police have released the settler and say his case is under investigation. No one here thinks a prosecution is coming. For them this accident is yet another example of life under occupation where they feel the slightest transgression brings down a forceful Israeli reaction while any settler aggression or incident largely goes unpunished. QALQILIYA (Ma‘an) 9 Sept — Israeli forces Friday dispersed a weekly protest in the village of Kafr Qaddum in the occupied West Bank district of Qalqilya, as several Palestinians reported suffering from tear gas inhalation. Murad Shtewei, the popular resistance coordinator in the village, told Ma‘an that a large number of Israeli forces raided the village with bulldozers and other military vehicles, and fired tear gas, stun grenades, and rubber-coated steel bullets soon after the protests began. Several Palestinians suffered from tear gas inhalation and were treated on the scene, Shtewei added … Residents of Kafr Qaddum began staging weekly protests in 2011 against land confiscations, as well as the closure of the village’s southern road by Israeli forces. The road, which has been closed 13 years, is the main route to the nearby city of Nablus, the nearest economic center. Following similar clashes that broke out last month, Shtewei told Ma‘an that more than 330 protests have been held over that period, during which time 84 protesters have been injured by live fire, including 12 children. Some 120 others have been detained at protests and were subsequently held in Israeli custody for periods ranging between four and 24 months, Shtewei said, adding that they have paid fines totaling some 25,000 shekels (approximately $6,488). Over the course of five years, an elderly protester was killed after suffering from excessive tear gas inhalation, one youth lost his eyesight, and another his ability to speak, he added. IMEMC 11 Sept — Israeli soldiers kidnapped, on Saturday evening, a Palestinian police officer, and detained several Palestinians, after stopping them at a military roadblock on the main entrance of Zababda town, southeast of Jenin, in the northern part of the occupied West Bank. Eyewitnesses said the soldiers kidnapped a Palestinian police officer, identified as Montaser Mohammad Abu ‘Arra, 35, after stopping on at the roadblock, and took him to an unknown destination. The soldiers also detained and interrogated many young Palestinian men while inspecting their ID cards, in addition to stopping and searching dozens of cars. IMEMC 11 Sept — Israeli soldiers invaded, on Sunday at dawn, the towns of Beit Fajjar, south of Bethlehem, and Ethna, west of the southern West Bank district of Hebron, searched homes and kidnapped two Palestinians. The soldiers also opened fire on farmers and homes, in the southern part of the Gaza Strip. Several military vehicles invaded Beit Fajjar before the soldiers broke into a number of homes, and searched them, and kidnapped a young man, identified as Mahmoud Abdullah Taqatqa. The soldiers also invade Ethna town, west of Hebron, and kidnapped Issa Mohammad Nattah, 36, from his home. BETHLEHEM (Ma‘an) 11 Sept — Israeli forces detained at least six Palestinian in overnight raids Saturday across the occupied West Bank, according to the Israeli army. An Israeli army spokesperson told Ma‘an that two Palestinians were detained in the Nur Shams refugee camp in the northern West Bank district of Tulkarm, another in the village of Beita in the northern district of Nablus, one in the Qaddura refugee camp in the central district of Ramallah, and two in Beit Fajjar, a village in the southern district of Bethlehem. BETHLEHEM (Ma‘an) 11 Sept — Sanaa Balboul, the mother of hunger-striking brothers Mahmoud and Muhammad Balboul, was able to visit her sons on Sunday for the first time since they were taken by Israeli soldiers after a raid on their home on July 9. The visit to the intensive care unit of Israel’s Wolfson Medical Center, where both Mahmoud and Muhammad are being treated, was facilitated by the International Committee of the Red Cross (ICRC). The video shows a visibly weak Muhammad embracing his mother for the first time in more than two months. However, due to a severe deterioration in his health, Mahmoud remained asleep throughout the visit. Meanwhile, Malik al-Qadi, the third Palestinian prisoner hunger striking against Israel’s policy of administrative detention — internment without charge or trial under which all three are being held — remained in a coma on Sunday on his 57th day without food. He is also in the intensive care unit of Wolfson Medical Center. On Friday, an Israeli court temporarily suspended al-Qadi’s administrative detention, just one day following the suspension of the Balboul brothers’ detentions. In all three cases, the courts said the sentences would be suspended until their health conditions improve. However, all three prisoners have steadfastly committed to their hunger strikes until they are completely released from administrative detention … It remained unclear as of Sunday if the detention sentences of three hunger strikers would be renewed after their suspension, or how the Israeli Supreme court decision would affect their strikes. BETHLEHEM (Ma‘an) 11 Sept — The Israeli Supreme Court ruled on Sunday that a law that permits force feeding hunger-striking Palestinian prisoners is constitutional, rejecting petitions filed last year by the Israel Medical Association (IMA) and by several human rights groups who argued the law contravened medical law and ethics regarding patients’ rights. The ruling comes after three Palestinian prisoners detained without charge by Israel have continued their hunger strikes for more than 60 days, despite each of their medical conditions having seriously deteriorated. Following the passage of the law in July 2015, the IMA had said that if it was upheld, Israeli doctors would be instructed to ignore it, according to Israeli newspaper Haaretz. “This is a case in which medical ethics unequivocally trump the law, and the message we wish to convey to physicians is that forced feeding is tantamount to torture and that no doctor should take part in it,” Haaretz quoted IMA chairman Dr. Leonid Eidelman as saying. However, justices reportedly decided on Sunday that the “complex” issue of hunger strikers transcended ordinary patients’ rights. A hunger striker “is not an ordinary patient but a person who knowingly and willingly places himself in a dangerous situation as a protest or a means of attaining a personal or public goal,” the justices reportedly wrote, adding that a hunger strike and its outcome have “implications that go beyond the personal matter of the hunger striker.”…. BETHLEHEM (Ma‘an) 10 Sept — A group of Palestinian youth, activists, and politicians staged a sit-in Saturday at the Bethlehem office of the International Committee of the Red Cross (ICRC) in the southern occupied West Bank, to show solidarity with hunger-striking Palestinian prisoners in Israeli custody. Spokesperson for the Bethlehem office of the Palestinian Prisoner’s Society Abdullah Zighari told Ma‘an that the offices were closed, but the protesters managed to access the reception hall which was left open. The main goal of the protest, he said, was to send a clear message to the ICRC to urge the organization to take practical steps to try and solve the question of hunger strikers “who are facing imminent death.” Chairman of a committee that coordinates between local committees against Israeli settlements and the separation wall Munthir Amirah said Saturday’s protest was meant to send a message not only to the Red Cross, but to all international organizations operating in Palestine. Those organizations, he said, “have not taken any effective measure to resolve the issue of Palestinian prisoners on hunger strike in protest against Israel’s policy of administrative detention” — under which Israel detains Palestinians without charge or trial under undisclosed evidence … “The next step will be open hunger strike until hunger strikers are freed.” Amirah urged average Palestinian citizens to “think seriously” about families who will spend the upcoming Muslim holiday Eid al-Adha without their children who are in Israeli custody…. RAMALLAH (Ma‘an) 12 Sept — Israeli authorities on Sunday released a high-raking Palestinian Authority (PA) security officer, after he served 15 years in Israeli custody. According to the Palestinian news agency Wafa, Major General Hussein Sawaadah, 63, was released from the Ofer detention center west of Ramallah in the central occupied West Bank. Wafa reported that dozens of Palestinian citizens and PA officials waited outside the front gate of Ofer prison to welcome Sawaadah upon his release. Immediately after he arrived in Ramallah, Sawaadah reportedly went to the Palestinian presidential compound where he laid flowers at the tomb of late Palestinian President Yasser Arafat. A reception was then held at offices of the PA military intelligence security service where Sawaadah served as deputy commander. NABLUS (Ma‘an) 10 Sept — Israeli forces Saturday continued to impose strict closures on Nablus-area villages of Beita, Einabus, ‘Urif, and Huwwara for the seventh consecutive day, claiming rocks had been thrown by Palestinians at settlers’ vehicles on the Huwwara main road. Israeli forces completely sealed the village of Beita on all sides with cement blocks and dirt mounds, leaving just one road from the village open, adding at least 20 kilometers onto the travel time for Palestinians trying to reach the village. A merchant working in the Beita village market Abu Muhammad told Ma‘an that the closures have caused the prices of fruits and vegetables to skyrocket due to the increasing price of transportation, adding that some merchants have refused to deliver to the market due to the Israeli blockade. Meanwhile, a bus driver working along the Beita-Nablus road Hashem Abu Zaitoun emphasized to Ma’an that Palestinians were suffering from the closure as residents have been forced to take dirt roads that take more than an hour-and-a-half to travel between Beita and Nablus, a trip usually taking some 15-20 minutes. Israeli forces have claimed that the closures were implemented as a result of rocks being thrown in the area at Israeli settlers’ cars; however Zaitoun told Ma‘an that witnesses and surveillance cameras had caught an Israeli settler stepping out of his car and smashing his own window several days ago near Huwwara road, reportedly in an attempt to frame Palestinians for throwing rocks. Israeli forces have been searching for Palestinian stone-throwers for more than a month, but have yet to detain anyone despite deploying dozens of soldiers and erecting checkpoints and cameras around communities, Zaitoun said…. NABLUS (Ma‘an) 11 Sept — Israeli forces allowed the Palestinian residents of several Nablus area villages to reopen the main entrances to their villages in the northern occupied West Bank Sunday morning, according to locals and Palestinian Authority (PA) officials. Sources in the PA’s liaison office told Ma‘an that after “exerting pressure on the Israeli side,” Israeli authorities agreed to reopen the roads, which Israeli forces had sealed off for a week under security pretexts, claiming rocks had been thrown by Palestinians at settlers’ vehicles on the main road of the Huwwara village, which leads directly to the city of Nablus. Israeli forces had closed the main entrances to the villages of Beita, Einabus [or ‘Aynabus], ‘Urif, and Huwwara, significantly affecting the mobility of residents and the businesses of merchants in the area. General commander of the Palestinian liaison office in the occupied West Bank Jihad al-Jayousi told Ma‘an that his office considered the road closures to be “collective punishment,” adding that they would continue to exert pressure on Israeli authorities to reopen other side roads in the villages of Beita and Madama that remained closed. An Israeli army spokesperson did not comment on the reports, saying that since the Palestinian residents physically opened the roads themselves, and not Israeli forces, it was not within the army’s purview to comment on the matter. GAZA (Ma‘an) 10 Sept — Israeli naval forces Saturday opened live fire at Palestinian fishermen’s boats off the coast of the Gaza Strip, while Israeli forces also shot live fire at Palestinian farmers in the eastern part of the besieged enclave. Witnesses told Ma‘an that Israeli military boats stationed near the northern Gaza Strip in the area of al-Sudanyah opened live fire at Palestinian fishermen. No injuries were reported. Meanwhile, locals told Ma‘an Israeli forces also opened live fire at farmers in the eastern Gaza Strip. IMEMC 12 Sept — Several armored Israeli military vehicles and bulldozers invaded, on Monday morning, Palestinian agricultural lands north of Beit Lahia, in the northern part of the Gaza Strip, bulldozed some of them and installed sand hills, in addition to firing live rounds. The soldiers advanced more than 150 meters into the Palestinian lands amidst sporadic gunfire, and started bulldozing some of them close to the border fence, and installed sand hills. The WAFA Palestinian News Agency said at least four tanks, and two armored bulldozers, invaded the lands after firing some smoke bombs, started uprooting sections close to the fence. WAFA added that military drones flew overhead while the soldiers invaded the lands and bulldozed them. GAZA (Xinhua) 11 Sept — Being unable to afford a sacrificial animal for Muslim’s Eid al-Adha feast, Mohammed Hadido, a Palestinian from the poverty-stricken Gaza Strip, purchased a share of a cow instead. “This is the only way I could follow the Islamic ritual,” the man in his 40s said. “The dire economic conditions of Gaza have prevented me from sacrifice during the feast for the past three years.” Eid al-Adha, the feast of sacrifice, is celebrated by Muslims worldwide in memory of Prophet Abraham’s near-sacrifice of his own son as ordered by God. Palestinians in Gaza have adopted the sharing system during the sacrifice feast in recent years due to the worsening financial situation of the majority of the population. This year, consumers can still buy shares in a cow or a calf and can pay on installments after agreeing with livestock merchants. “I bought one share in a cow for 1,500 Israeli Shekels (about 400 U.S. dollars). I will pay the money on installments during the coming 10 months,” Hadidi told Xinhua as he was checking the cow he and five of his friends have shared. Only rich people can afford buying a sacrifice in a community that suffers from high rate of unemployment and more than half of the residents live under the poverty line … Although prices of sacrificial animals have down this year, the purchasing power has been low due to the ailing economy of the blockaded seaside territory. Livestock traders have been eagerly waiting for the holy feast to sell their cattle. But the poverty of most of Gaza’s population and the closure blocked their hopes of a better season…. GAZA STRIP (Al Jazeera) 7 Sept by Isra Namey — The past year has been exhausting for Umm Abdeldaim Abu Lebdah, whose only son went missing in Egypt’s Sinai Peninsula in August 2015, along with three other young men. “I see the world through my son’s eyes; his abduction has turned my life into a living hell,” the 53-year-old mother told Al Jazeera. The four men, members of a Hamas naval commando unit, were abducted by masked gunmen just outside of the Rafah crossing terminal in Egypt while en route to the Cairo airport. Her son, 25-year-old Abdeldaim, had been bound for Turkey to pursue postgraduate studies in engineering. Families of the four missing men say that contact was lost on August 19, 2015, after gunmen stopped the bus they had boarded outside of the Rafah terminal. Where they were taken from there remains unclear. “It is really mysterious that the bus was ambushed while it was escorted by Egyptian soldiers, and in an area that fully lies under Egyptian sovereignty,” Mohammed Abu Libdah, Abdeldaim’s uncle, told Al Jazeera. The crisis has fueled tensions between Hamas, which rules the besieged Gaza Strip, and the Egyptian regime. For months, Egyptian authorities have denied any involvement in the men’s disappearance, instead blaming armed groups in the Sinai. However, a newly leaked photograph purports to show Abdeldaim and one of his friends, Yasser Zanoun, imprisoned at an Egyptian security facility in Cairo. The apparent confirmation that they are alive has partially comforted the men’s families, but their appearance in the photo – tired and half-naked in an overcrowded cell – was distressing, Abdeldaim’s mother said. After viewing the photo, she collapsed and was taken to hospital. Two months earlier, Hamas had sent a delegation to Cairo to inquire about the four missing men. The delegation asked Egyptian intelligence officials to release their location, but the trip was to no avail. Hamas parliamentarian Yahia Mousa told Al Jazeera that international organisations and foreign ambassadors – the identities of whom he would not specify – have also urged Egypt to resolve the situation, but little progress has been made. “The Egyptian attitude suggests that Hamas must pay a price in return for any information regarding the men,” Mousa said, alleging that Egypt has indirectly acknowledged holding the men as political hostages, placing conditions on their release…. MER 12 Sept by Abu Mosab — When I finished high school, I was faced with two choices. I could complete my studies or start working. Unfortunately, I chose the second. I decided to work because attending university requires a lot of money in Gaza. My family could not afford the school fees, which is 400 USD per semester for an English Literature major. After graduation, I began searching for work but like most youth in Gaza, I could not find anything because during that period there was a severe Israeli blockade on Gaza, same as there is today. The economic terrorism of the forbidden blockade has prevented business growth and forced many businesses to close entirely. After many attempts searching for employment, it become clear to me that there would be only one type of work available during that period. In the underground tunnels. After many hours of deliberation, I decided to visit the tunnels to seek work. I had heard about the tunnels on TV but I never saw them before. I heard they are very dangerous and every few days someone dies there. But the workers are paid good money and that’s what I was looking for. I went there secretly, without telling anyone in my family because I knew if I told them they would prevent me from going … During the 4 months I worked in the tunnels, I came face to face with death many times. I witnessed too many workers injured, while others died. I lost count of the times the tunnels suddenly collapsed. Sand fell on top of us and we had to quickly dig our way out so we would not suffocate and die. One time I was severely injured by a machine that pulls the heavy material through the tunnel. It was a motor that flew out of its place in the floor and slid along the ground. A metal piece had broken off and rammed right into my chest. To this day, I still have pain in my ribs … The reality is not as Israel claims. During the four months I worked in the tunnels, I did not see a single Hamas rocket smuggled into Gaza. Not a single gun or weapon. The mass majority of supplies we carried into Gaza, was food for my people. Mostly sugar, chocolate for shops to sell, iron for blacksmiths, cheese, Coca Cola, wire cabals for electricity, car parts and then many other kinds of food…. Motherboard 10 Sept by Hunter Stuart — Outside, horses and donkeys pull creaking wooden carts of vegetables down the street. Inside, dozens of people are hunched over laptops, working out the code for mobile apps that they hope to take public within the year. This is the “Gaza Challenge,” a five-day tryout event for Palestinian entrepreneurs in the Gaza Strip, a Philadelphia-sized enclave in the Middle East that’s been under an Israeli- and Egyptian-imposed blockade for the past nine years. The organization behind the Gaza Challenge is Gaza Sky Geeks, a startup accelerator that mentors new tech startups in the Gaza Strip. Nuwar Abu Awwad, 21, is here to present her idea for a web platform that will provide new entrepreneurs in the Middle East with Arabic-language resources that they can use to solve problems they may encounter with starting a business … The service will be called Tashbeak, which means “making connections” in Arabic. Of course, this is still theoretical: Abu Awwad and her three partners are just one of 46 teams here at the Gaza Challenge, and only 10 to 12 of those teams will proceed to the next phase, a five-month “incubation” period where products are actually deployed online to see if people use them and like them and why. Gaza Sky Geeks is a project of the Oregon-based charity Mercy Corps, and is based out of a loft and co-working space in central Gaza City, a chaotic, lively city that is still being rebuilt from the 2014 war with Israel…. +972 blog 10 Sept by Yossi Gurvitz, written for Yesh Din — How does the IDF deal with a brush fire? Depends whether it threatens Jewish or Palestinian property — In the beginning of May 2016, S., a resident of the West Bank village of Sur, returned to his village and immediately noticed heavy smoke billowing from his land. Normally in such cases one hastily summons the firefighters; but we are dealing with the West Bank under Israeli military rule, so things tend to get complicated. S. grows olives on his land, where he owns around 100 trees. He lives off the olive harvest, estimating that he produces between 200 to 250 olive oil drums — each one weighing 17 kilograms — per season. Unfortunately for S., Israel built the settlement of Sil’it right next to his land … The distance between S.’s land and Sil’it is only 150 meters (some 450 feet). In 2004, under the cover of the Second Intifada, Sil’it’s security fence was expanded to include S.’s land. Now there is both a fence and gate between him and his land, meaning he can no longer reach his land – no one disputes the land is his – unless he receives prior permission from the military commander. In 2009 his land was set ablaze; he believes Israeli civilians were responsible. During last year’s olive harvest, S. managed to obtain permission for his workers for three workdays – yet the IDF prevented them from accessing the land. S. kept trying to get them permits to work the land, but the IDF bureaucracy is slow, and in the meantime the harvest season passed. Half a year later S. was standing and watching his land burning from across a locked gate. He called the Palestinian District Coordination Office (DCO), which in turn summoned Palestinian firefighters. But the IDF did not allow them to enter the land; it is unlikely we will ever know the reason for the refusal. But the wind, damn it, the wind — it does not discriminate between Palestinian or Israeli property; it is indifferent to land documents and ethnicity. The wind blew the fire toward Sil’it. The distance, you will remember, is only 150 meters. And then S. beheld a wondrous sight: as the flames consumed his land while Palestinian firetrucks were prohibited from aiding him, Israeli firetrucks swiftly reached the other side of his plot and quickly began dowsing the flames. The firetrucks weren’t sufficient, so a short time afterward two firefighting planes flew overhead and extinguished the fire, which nearly reached the gates of Sil’it…. JERUSALEM (Ma‘an) 11 Sept — Israeli authorities reportedly sealed two unused graves in the Bab al-Rahma cemetery outside the eastern wall of the Old City in occupied East Jerusalem Sunday morning, according to witnesses. Witnesses told Ma‘an that inspectors from the Israeli Nature and Parks Authority entered the cemetery under Israeli police protection when they sealed off two pre-dug, unused graves. It remained unclear if the graves were filled and sealed with concrete or dirt.Palestinian workers from the Al-Aqsa Mosque compound highlighted that the Nature and Parks Authority along with other Israeli authorities have been “trying to confiscate parts of the Bab al-Rahma cemetery to use them as pedestrian lanes for Jewish parks” for some time. An Israeli Nature and Parks Authority spokesperson was not immediately available for comment. OCCUPIED JERUSALEM (PIC) 9 Sept — Dozens of Palestinians performed Friday prayers at the ruins of the demolished houses in Qalandia to the north of Occupied Jerusalem. Locals said that the event came to confirm their adherence to their lands and their determination to rebuild their demolished houses in defiance to Israel’s displacement policy. The residents also declared their intention to perform Eid al-Adha prayers in the same place. Last July, Israeli municipal crews demolished 11 buildings, which include 30 apartments, in Qalandia under the pretext of being built without permit. RAMALLAH (ISM) 9 Sept — At a time of increasing settler violence in the West Bank, the International Solidarity Movement is issuing an urgent call for volunteers to participate in the 2016 olive-harvest on the invitation of Palestinian communities. The olive tree, a national symbol for Palestinians, is an affirmation of Palestinians historical connection to their lands. Israeli Forces and settlers have tried in numerous occasions to disrupt this special relationsship between the Palestinians and this thousand-year old crop. Thousands of olive trees have been bulldozed, uprooted and burned by Israeli settlers and the military, but Palestinians farmers refuse to be intimidated – under the Israeli occupation harvesting has become more than a source of livelihood; it has become a form of resistance. In solidarity with Palestinians farmers, ISM volunteers help with the olive harvest each year. If you join ISM over the olive harvest you will work with other ISM’ers in Palestinian olive groves especially exposed to violence and harassment from Israeli settlers and military. Our presence can make a big difference. It has been proven in the past to deter the number and severity of attacks as well as harassment, hence supporting the Palestinians universal right to be and work on their lands. International solidarity activists engage in non-violent intervention and documentation and this practical support enables many families to pick their olives. In addition, The olive harvest also provides a wonderful opportunity to spend time with Palestinian families in their olive groves and homes, there is nothing like sipping tea under a olive tree after a long day’s work. The harvest will begin in start-October and run until mid-November. We request a minimum 2 week commitment from volunteers but stress that long-termers are needed as well. We kindly ask that volunteers start arriving in the first week of October, so we are prepared when the harvest begins. End the Occupation — WHEN: Friday, September 16, 12:00 PM WHERE: Rayburn House Office Building, Room B-338 — In this first-of-its-kind briefing on Capitol Hill, hear from organizers campaigning for BDS on campus, in churches, in boardrooms, and in support of Americans’ constitutionally-protected right to do so. Hear from actual practitioners of BDS what the movement is about, why certain corporations and institutions are targeted for BDS actions, and the goals of the BDS movement. IMEMC/Agencies 11 Sept — Cadiz, provincial capital in the autonomous community of Andalusia in the Spanish state, has become the latest municipality to pass a motion supporting the Palestinian-led Boycott, Divestment and Sanctions (BDS) movement for Palestinian rights and declaring itself an Israeli “Apartheid Free Zone”. With a population of 120,000, Cadiz joins more than 50 cities and towns across the Spanish state which have voted to declare themselves spaces free from Israeli apartheid. Other famous Apartheid Free municipalities include Gran Canaria, Santiago de Compostela, Xixón-Gijón, Sevilla, Córdoba and Santa Eulària in Ibiza. Inspired in part by a similar campaign during the struggle against apartheid in South Africa in the 1980s, the Israeli Apartheid Free Zone campaign, led by the Solidarity Network Against the Occupation of Palestine (RESCOP), seeks to create ‘islands of political consciousness’ and to break local ties with Israel’s regime of occupation, settler-colonialism and apartheid, as well as with international corporations and institutions that are complicit in the maintenance of Israel’s violations of international law. The campaign, which is supported by social movements, businesses, schools, media and public institutions from across the Spanish state, has created a map indicating spaces free from Israeli apartheid. By declaring themselves Israeli Apartheid Free Zones, local authorities agree to boycott corporations complicit in violations of international law and the rights of Palestinians as well as break ties with the Israeli regime and its complicit institutions. They will also support local awareness raising efforts and commit to conscientious procurement policies based on the human rights of the Palestinian people…. JPost 7 Sept — Eno: “Your dance company might not be able to formally distance itself from the Israeli government but I can and will.” — British ambient composer Brian Eno will not allow Israeli dance company Batsheva to use his music in their upcoming performance due to his affiliation with the Boycott, Divestment and Sanctions (BDS) movement. According to The Guardian, Batsheva was planning to use his piece “Neroli” in a series of performances Tuesday in Italy that are sponsored by the Israeli embassy in a piece entitled “Humus.” This particular piece is a prominent one in Batsheva’s repertoire. “It has recently come to my attention that you have been using a piece of my music in a work called Humus,” Eno wrote in a letter to Batsheva. “I was not aware of this use until last week, and, though in one way I’m flattered that you chose my music for your work, I’m afraid it creates a serious conflict for me. “To my understanding,” Eno continued, “the Israeli embassy (and therefore the Israeli government) will be sponsoring the upcoming performances, and, given that I’ve been supporting the BDS campaign for several years now, this is an unacceptable prospect for me. “It’s often said by opponents of BDS that art shouldn’t be used as a political weapon. However, since the Israeli government has made it quite clear that it uses art in exactly that way – to promote ‘Brand Israel’ and to draw attention away from the occupation of Palestinian land – I consider that my decision to deny permission is a way of taking this particular weapon out of their hands…. Palestine Monitor 5 Sept by Matt Broomfield — The Israeli Forces have turned occupation into an “art form”, former general Gadi Shamni has recently claimed. But if occupation can be art, then art can be resistance, and members of the Jenin Freedom Theatre say their month-long tour of Portugal will be a vital part of the Palestinian struggle. “The Freedom Theatre aims to resist through culture,” actor Mohammed* told the Palestine Monitor. “It’s a less visible side of our fight. The occupation tries to delete our culture and history, or to steal it and say it’s their own.” Kicking off with a performance in Lisbon on September 3, the Freedom Theatre will spend the month showcasing Palestinian history and culture across Portugal. Touring from the capital to the second city, Porto, and a number of smaller towns, the company will return to Palestine after a final show in Tondela on September 25. One performance, in Vila Nova de Gaia, is taking place in solidarity with Syrian refugees. Money from ticket sales will be donated to the League of Friends of the Health Center Soares dos Reis (LACSSR), supporting refugee families rehoused in the northern city. The tour features two plays … It is a decade since the Theatre opened, but the belief of its murdered founder Juliano Mer Khamis in the possibility of a “cultural Intifada” still inspires actors like Mohammed. But this ideology – that “art cannot exist without politics” – causes the theatre itself to suffer under “the art of occupation”. Leading Theatre members have been imprisoned, and their home in Jenin refugee camp regularly invaded by Israeli forces. Most recently, actors leaving for Portugal ran into difficulties at the Jordanian border, though it looks like the whole company will eventually make it to Europe…. Haaretz 7 Sept — A school atlas that labels Jerusalem as the capital of Israel will not be removed from Czech schools after all. The Czech education ministry said last week that the atlas would be removed following a complaint by the Palestinian ambassador in Prague. But on Tuesday night, Education Minister Katerina Valachova told Czech Radio that Israel’s capital won’t be changed to Tel Aviv in the textbooks. The school atlases would portray reality, stated Valachova. “Jerusalem is Israel’s capital from the viewpoint of the declaration of the country to which this relates, which means Israel,” she said in the radio interview, reported the Prague Daily Monitor on Tuesday. “If there is a sentence relating to all of the international steps, I believe that this fact will not offend either side.” The atlas has a valid certificate for textbooks until 2017 and the ministry will not interfere with it, Valachova said. Haaretz 4 Sept — Syracuse University reneges on screening of Shimon Dotan’s ‘The Settlers’ sparking accusations of quashing free speech in name of political correctness — Syracuse University has backed off plans to show acclaimed and criticized “The Settlers” documentary fearing possible protests by the campus Boycott, Sanctions and Divestment movement (BDS), The Atlantic and the local campus newspaper report. Israeli filmmaker Shimon Dotan had been invited to speak at the upstate New York campus along with the showing of his film at an international conference on religion and film scheduled to take place in March 2017. His film has won accolades for its detailed illustration of the lives of Jewish settlers in occupied territory, providing a frank and critical picture, some reviewers say. It has also been criticized as presenting a one-sided picture for offering barely a mention of Palestinians, who are a majority of the West Bank population, living under Israeli military rule. Alternet 9 Sept by Sarah Lazare — When the Standing Rock Sioux Tribe mobilized thousands to protect their land and water in Cannon Ball, North Dakota from a proposed $3.8 billion crude-oil pipeline, they were met with national guard deployments, police crackdowns, an FBI investigation and private security forces that attacked them with dogs. A key firm hired during this time to provide security for the pipeline company, Dakota Access LLC, is the British multinational G4S — one of the largest private security corporations in the world targeted by a years-long global boycott campaign for profiting from the inhumane treatment of Palestinians in Israeli prisons, including the torture of children. G4S announced in March that it plans to halt all of its business with Israel in the next 12 to 24 months, in what was hailed as a significant human rights victory, with international campaigners vowing to hold the company to its word. However, the corporation’s role in protecting the Dakota access pipeline indicates that G4S is profiting from a different colonial context, this time in North Dakota’s Indian country…. EI 10 Sept by Andrew Kadi — Palestinians are expressing support for the Standing Rock Sioux Tribe in their months-long resistance to the US government’s plan to install an oil pipeline on their land. “The people of Palestine supports you and all those standing with you right now in North Dakota to protect your tribal lands and resist the desecration and destruction of your sacred burial sites at the hands of the Energy Transfer Partners corporation and the Dakota Access Pipeline they are building,” the Palestinian BDS National Committee said on Friday. In another statement issued on Friday, individual Palestinians around the world say they “recognize the multitude of ways that Native American and First Nation struggles to protect indigenous territories have ultimately been struggles on behalf of all of humanity.” Their full statement is below. IMEMC/Agencies 10 Sept — PLO Executive Committee Member Dr. Hanan Ashrawi recently met with a visiting delegation of Palestinian business and civil society leaders from Chile at the PLO Headquarters in Ramallah, and welcomed them to Palestine. At the beginning of the meeting, Dr. Ashrawi called on the members of the delegation to maintain a link to Palestine and to engage in a joint discourse and projects with Palestine: “In light of Israeli efforts to eradicate the Palestinian identity and erase our strong connection to the land, history and culture, I am extremely encouraged by Palestinian expatriates, exiles and refugees who return to their homeland and are ready to invest in Palestine in a variety of ways. We are not ready to disappear or abandon our rights. By returning to Palestine and maintaining your links to the homeland, you are reaffirming the Palestinian connection to the land and our right to exist in freedom and in dignity.” According to the PNN, Dr. Ashrawi led a candid discussion on the Israeli state’s unilateral violations of international law and Palestinian rights, and the systematic efforts to destroy the chances for peace and stability. Al-Monitor 9 Sept by Daoud Kuttab — In a long interview with Egyptian ONTV Sept. 1, Jibril Rajoub, the head of the Palestinian Football Association, appeared to ridicule Palestinian Christians. Almost a week later, on Sept. 6, Rajoub insisted in an interview on Al-Quds TV that when he referred to the “Merry Christmas people,” he was merely being jovial. He claimed that he had often used the term and that no one had ever complained about it. Many Palestinian Christians, including Atallah Hanna, a Greek Orthodox archbishop of Sebastia, weren’t laughing and demanded an apology. After initially hesitating, Rajoub apologized on Palestine TV Sept. 7 after a meeting in Ramallah with Catholic bishops who accepted the apology and asked that the incident be forgotten. Regardless, the episode has left a bad taste among a Palestinian community revealed to be fragile. The context of Rajoub’s utterance was another reason it upset so many people. Talking about the 2012 municipal elections, Rajoub complained in the hour-long ONTV interview (later rebroadcast on Palestinian TV) that Palestinian Christians — or as he called them in that instance, the “Merry Christmas people” — had voted for Hamas candidates in the West Bank. The criticism was not taken lightly, with many noting that in elections, Palestinian Christians, like Palestinian Muslims, have the right to choose whomever they want and not have it used against them … Hanna, angered by Rajoub, posted a statement Sept. 3 on his Facebook page that was republished on many local websites: “Palestinian Christians are not the ‘Merry Christmas people,’ but we are the people of the first church, which sent its Christian message from Palestine to the world. We are proud of our Eastern Christian origin, whose light came from the Holy Land and spread to the entire world.” Amid the widespread criticism of Rajoub, a number of Palestinians came to his defense, claiming that they know him and that he is not sectarian or racist. Sami Awad, the director of the Bethlehem-based Holy Land Trust, told Al-Monitor that Palestinians should not fall into what he called “a trap,” saying that Palestinians have become overly sensitive to any somewhat provocative or challenging statement…. GAZA CITY (Al-Monitor) 11 Sept by Moath al-Amoudi — Palestinian society remains a patriarchal one, hindering women’s access to their rights. Palestinian women are often denied their rights by their husbands, fathers or even tribal sheikhs. Some males consider that even mentioning the name of a woman in Palestinian events, such as weddings at the social level or in the elections at the political level, is unacceptable. Women’s names are thus hidden, and instead they are identified as “sister of” or “wife of,” or by her initials. Some lists taking part in the Palestinian local elections that were slated for Oct. 8, but have now been delayed, replaced the names of their female candidates with “wife of” or “sister of.” When this happened in a list in the village of Tammun, south of Jenin, Palestinians condemned this act and the Arabic hashtag that translates into “Our names should not be covered” went viral among Palestinians. Not only are the names of females removed from the electoral lists, the name of the bride is often absent from wedding invitation cards and substituted with her initials. Nadia Abu Nahla, the director of the Women’s Technical Affairs Committee (WATC), told Maan News on Sept. 1, “The fact that some lists covered the names of female candidates is viewed as a serious decline in the lists’ capabilities and in the way these movements think, even though the actions are justified as being in line with the social [conservative] character in some areas.” Abu Nahla continued, “If their names are not recognized, how can women’s needs be added to the planning and coordination of the municipal agenda.” Amal Habib, the presenter of the “Beitna” show dedicated to women on the Hamas-run Al-Aqsa TV channel, told Al-Monitor, “I think it’s shameful that some people still believe that women’s names should be omitted. I’m shocked at this culture and how it was embraced. Women should be called by their names out of respect and our names should not be hidden.”…. techcrunch 8 Sept by Mike Butcher — Some people might be wondering why a hashtag to do with Paypal has been blowing up on twitter in the last two days. The #PayPal4Palestine hashtag has been making waves on social media after 43 companies and organizations in Palestine published an open letter to Paypal asking for the payment platform to work there. The move came only after PayPal ignored their requests for a formal meeting. PayPal currently does not work for Palestinians in the West Bank or Gaza, but does work for Israelis living in settlements in the West Bank, which are illegal by international law. Israelis and Palestinians also all use the same currency, the Israeli Shekels. But quite how an Internet platform could work in some areas of a country but not in another — where the areas in question are are in some cases literally meters apart — is puzzling to say the least. The group behind the hashtag and the letter, Americans for a Vibrant Palestinian Economy (A4VPE), ask PayPal CEO Daniel Shulman (pictured) to consider the fact that PayPal operates in 203 countries, many of which could be considered far less stable than Palestine, including Somalia and Yemen. Yemen is currently engaged in a devastating civil war, while Somalia has been war-torn for many years … PayPal has a major operation in Israel in the form of its risk team. Haaretz 11 Sept by Elihay Vidal — A delegation of Facebook executives visiting Israel this week will be meeting with government officials amid controversy over the role of the company as a conduit for incitement to violence. Prime Minister Benjamin Netanyahu regarded the meeting as important enough to mention it in his opening remarks to the cabinet on Sunday. “The goal here is to improve cooperation against incitement – the incitement to terror and murder – on the social network,” the Prime Minister’s Website quoted him as saying. Facebook has come under fire by Israeli politicians and officials for failing to block Palestinians from posting messages encouraging violence. The concern has grown in the last year amid a spate of attacks by young people unaffiliated with organizations but reportedly inspired by social media. In July, Public Security Minister Gilad Erdan accused Facebook and its chairman and cofounder Mark Zuckerberg of partial responsibility for terrorist attacks, including the murder of 13-year old Hallel Yaffa Ariel in the West Bank settlement of Kiryat Arba the month before. “Facebook has turned into a monster. 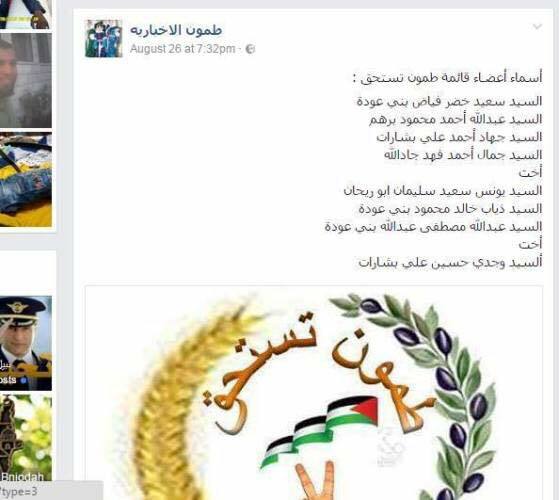 The younger generation in the Palestinian Authority runs its entire discourse of incitement and lies and finally goes out to commit murderous acts on Facebook’s platform,” he told Channel 2 television … For its part, Facebook says it has rules for what constitutes acceptable content and meets regularly with policy makers in and out of government on these issues. “There is no place for content encouraging violence, direct threats, terror or hatred on our platform,” the company says. MEE 11 Sept — Even by the standards we have come to expect from Israel’s armed forces, the circumstances and aftermath of the killing of Mustafa Nimr by Israeli border police in Shuafat refugee camp last Monday take some beating for their sheer cruelty and gall. At the end of an overnight raid in Shuafat early Monday, Israeli forces opened fire on a vehicle in what authorities immediately described as a thwarted car-ramming attack. Passenger Mustafa Nimr was killed, while the driver, his cousin Ali, was wounded and detained. To be clear: the statement given to the media by the Israeli police spokesperson said that the car had sped towards the border police officers and tried to run them over. The officers only opened fire, she said, after having warned the vehicle to stop. Mustafa’s grieving family, however, insisted that this had been no car-ramming attempt, an account backed up by eyewitnesses. Photographs showed bread and children’s clothes on the back seat of the car, covered in broken glass and blood. ‘Killed by mistake’? The next day, Israeli officials informed the family that Mustafa had been “killed by mistake”. On Tuesday night, Israeli TV broadcast amateur video footage from the scene where shots can be heard after the car had already stopped and Ali was lying on the floor. But the story wasn’t over. It then emerged that Israeli police were looking to charge Ali, the wounded survivor of the shooting, with causing the death of his own cousin. The rationale for this was that by his “reckless” driving he had caused officers to open fire … This is not the first time, even during the last year, that Israeli authorities’ account of a fatal shooting of a Palestinian has come unstuck. The question is this: what will it take for the Western media to stop taking Israeli authorities’ version of events at face value? And why is this even a problem to begin with? Is there a bias towards trusting a police or army statement? Does a lack of time – or inclination – prevent a military spokesperson’s account being compared with, or quoted alongside, reports by Palestinian media, eyewitnesses, or friends and relatives of the deceased? It is not difficult to do. And yet, as I have written before, since October 2015 the English-language Western media has, on the whole, completely failed to treat Israeli authorities’ claims with the scepticism – or even basic fact-checking – that they clearly merit. Context paragraphs often look like this recent example from Associated Press: “Since September 2015, Palestinians have killed 34 Israelis and two visiting Americans in attacks. Some 209 Palestinians have been killed in that time, most of them identified as attackers by Israel.” However, on this occasion, AP added the following in its reporting on the Shuafat shooting: “Palestinians have frequently accused Israelis of using excessive force against assailants and said in many cases, alleged assailants were not even attackers.” This is a welcome addition, and one can only hope that other news agencies and outlets take note. It is, however, still lacking; there is no mention, for example, that the Palestinian death toll includes unarmed civilians shot dead during protests and confrontations with Israeli forces…. MEMO 6 Sept — Division within Palestinian society has reached unprecedented levels, becoming a major hurdle on the path of any unified strategy to end Israel’s violent occupation or to rally Palestinians behind a single objective. Newly appointed Israeli ultra-nationalist Defence Minister Avigdor Lieberman understands this too well. His tactic since his ascension to office last May is centered on investing more in these divisions as a way to break down Palestinian society even further. Lieberman is an “extremist”, even if compared with the low standards of the Israeli military … Fairly recently, in 2015, he threatened to behead with an axe Palestinian citizens of Israel if they are not fully loyal to the “Jewish state”, advocated the ethnic cleansing of Palestinian citizens of Israel, and made a death ultimatum to former Palestinian Prime Minister Ismail Haniyeh. Outrageous statements aside, Lieberman’s latest ploy, however, is the most outlandish yet. Israel’s defence minister is planning to colour-code Palestinian communities in the Occupied West Bank, dividing them into green and red, where green is “good” and red is “bad”; accordingly, the former shall be rewarded for their good behaviour, while the latter collectively punished, even if just one member of that community dares to resist the Israeli occupation army. A version of this plan was attempted nearly 40 years ago, but utterly failed. The fact that such appalling thinking is occurring well into the 21st century without being accompanied by international uproar is baffling. Lieberman’s colour-codes will be accompanied by a campaign to resurrect the “Village Leagues”, another failed Israeli experiment to impose an “alternative” Palestinian leadership by “engaging” Palestinian “notables”, not democratically-elected leaders. Lieberman’s solution is to manufacture a leadership, which, like the Village Leagues of the 1970s and 80s, will, most certainly, be regarded as collaborators and traitors by the wider Palestinian society. But what is the “Village Leagues” exactly and will it work this time around? But what is the “Village Leagues” exactly and will it work this time around? In October 1978, elected Palestinian mayors, joined by town councilors and various nationalist institutions, began a campaign of mass mobilisation under the umbrella of the National Leadership Committee, whose main objective was to challenge the Camp David Treaty – signed between Egypt and Israel – and its political consequences of marginalising Palestinians. At the time, the movement was the most elaborate and united network of Palestinians ever assembled in the Occupied Territories. Israel immediately cracked down on the mayors, union leaders and nationalists of various professional institutions. The national response was insisting on the unity of Palestinians in Jerusalem, the West Bank and Gaza, among Christians and Muslims, and Palestinians at home and in “shattat”, or the Diaspora. The Israeli response was equally firm. Starting 2 July 1980, an assassination campaign against the democratically-elected mayors ensued…. Haaretz 11 Sept — If Mr. Netanyahu really wants to know what ethnic cleansing means, he should ask the Palestinian citizens of Israel. 85% of the Palestinians living in what is now Israel were forced out in the 1948 Nakba – just because they weren’t Jews — Mr. Netanyahu’s recent comparison of Palestinian citizens of Israel with its illegal settlers in Occupied Palestine is not only immoral, but a total departure from rationality, history and Israel’s obligations under international law. He should realize that no matter Israel’s institutionalized system of discrimination, this is our homeland and we are here to stay. First of all, Palestinian citizens of Israel are not foreign immigrants that came to Israel and applied for visas or citizenship, rather Israel went to them. They are the indigenous population of the country. They lived there way long before the Zionist movement was created. They are those who later survived the Nakba of 1948, where 85% of the Palestinians living in what is now Israel were ethnically cleansed only because they were not Jews. Yes, they can tell Mr. Netanyahu about the meaning of ethnic cleansing on this land. As a representative of the Palestinian Arab community in Israel, I reject the comparisons stated by Mr. Netanyahu between our existence and the presence of settlers in Occupied Palestine. We are not Israeli settlers, Mr. Netanyahu. Comparing us with the illegality of a foreign occupation only reflects your belief that nobody else other than Jews could call this place homeland. EI 6 Sept by Mohamed Mohamed — A friend of mine recently shared an image meant to show solidarity with Palestine. At first glance, I thought it was nice: it depicts a heart that is outlined with the word “Palestine,” is filled with the names of many Palestinian cities and is decorated with the colors of the Palestinian flag. Naturally, I tried to find the city of Safad, which is near the birthplace of my grandparents. I couldn’t find it, but I also couldn’t find other nearby cities such as Akka, Haifa or even Nazareth. Then it became clear: none of the Palestinian cities seized by Zionist forces during the 1948 Nakba were included in this Palestine heart. As a descendant of Palestinians from a village in what is now known as Israel, the barrage of Israeli propaganda attempting to bury the history of our existence is not surprising. One can expect no less from a state that was created through the expulsion and subjugation of an existing population. Discrimination against Palestinians is not perpetrated solely by the Israeli state; it is endemic to Israeli society itself. A recent Pew survey indicates that almost half of Israeli Jews believe that Palestinian citizens of Israel should be expelled from the country and 79 percent believe that Jews deserve preferential treatment in Israel. Yet the heart image, which ignores a key injustice perpetrated against Palestinians, presumably originated from a supporter of Palestine. It is just another picture among millions being shared online, but it serves as a reminder of how the plight of Palestinians dispossessed in 1948 has in many ways been forgotten, even by those who are supportive of the Palestinian cause. The right of return, a cornerstone of the Palestinian struggle, is the principle that Palestinian refugees have an inalienable right to return to their homeland. This includes those who fled or were forced to flee in 1948 as well as in 1967, along with their descendants. The right of return is also enshrined in international law…. He dropped by for coffee and as he was leaving , mentioned that he had accidentally run over a Palestinian child and when asked where he responded, “Not sure really but it was near efrat .”Thanks for letting us know yossi , we will see you get credit for your efforts to resolve the demographic threat.Don,t forget to claim your mileage and time lost at work. The settler may have been born and raised in, say, Brooklyn, and he moved to get government subsidized housing and other perks, paid for by US taxpayers under Israel’s fungible approach to such gifts, and to loose his full bigotry. What are they whacked out on? Israel hasn’t been able to write its promised constitution, without which there has never been a legally elected government in the State of Israel.